The first official taverns in New York City started opening about about a century after New York became a colony in 1664. Although the first real bars didn’t open until the mid-18th century, many people were selling food and drinks from their home. 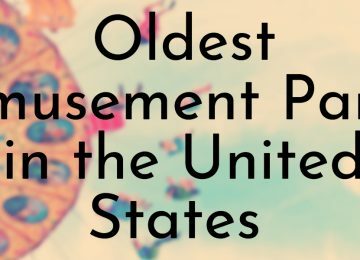 Many of the bars on this list were originally built for another purpose (such as a home or grocery store) and were later converted into taverns and restaurants. All of these bars, except for one that is being renovated, are still open today. Nearly all of the buildings are historic landmarks and are listed on the U.S. National Register of Historic Places. 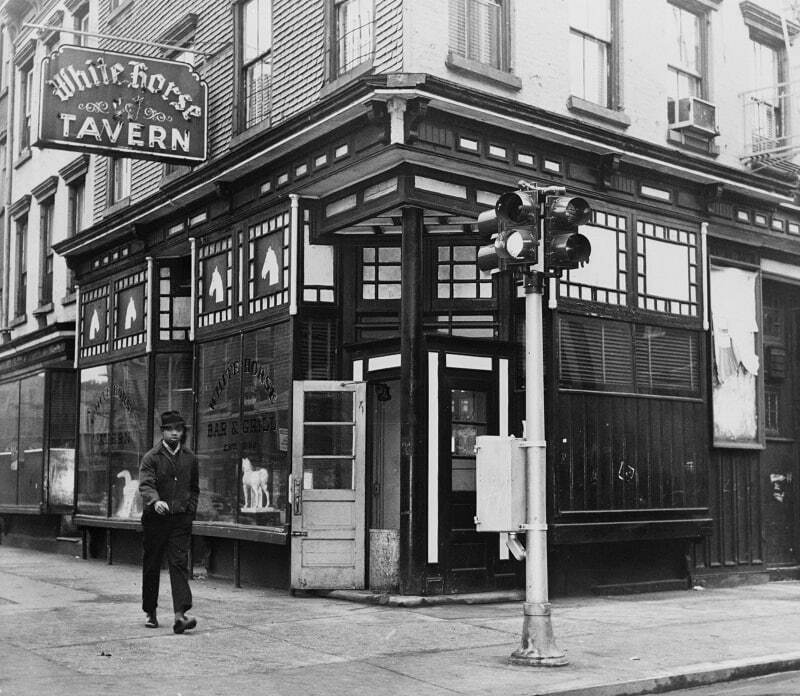 The White Horse Tavern is known for being a favorite hang out spot for New York’s literary community. 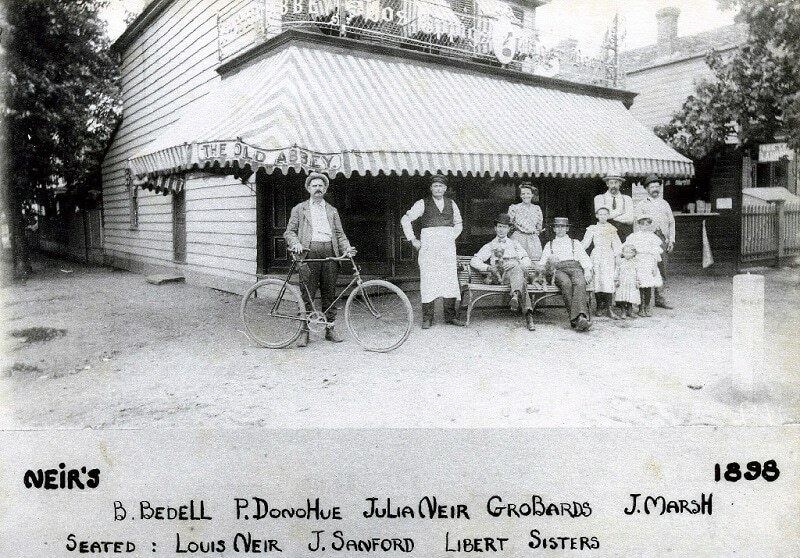 The bar opened in 1880 and was originally a longshoreman’s bar serving the men working the piers lining the Hudson river. The White Horse became popular with writers and artists in the early 1950s after Dylan Thomas started frequenting the bar. 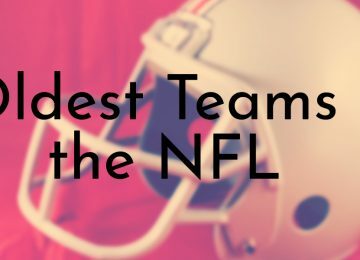 After this, other writers such as Jack Kerouac, Hunter S. Thompson, and Norman Mailer became White Horse Tavern regulars. Around this same time, the White Horse became a meeting place for labor members, organizers, and socialists. The idea for the Village Voice, an American newspaper known for being the first alternative newsweekly, was discussed at the bar. The original offices of the Village Voice were located within a few blocks of the White Horse and the editors would frequently meet at the bar. Julius’ is considered the oldest continuously operating gay bar in New York City. The building was first built in 1826 and initially housed a grocery. It became a bar in 1864 and eventually became a popular watering hole for the jazz musicians coming from nearby jazz club Nick’s. 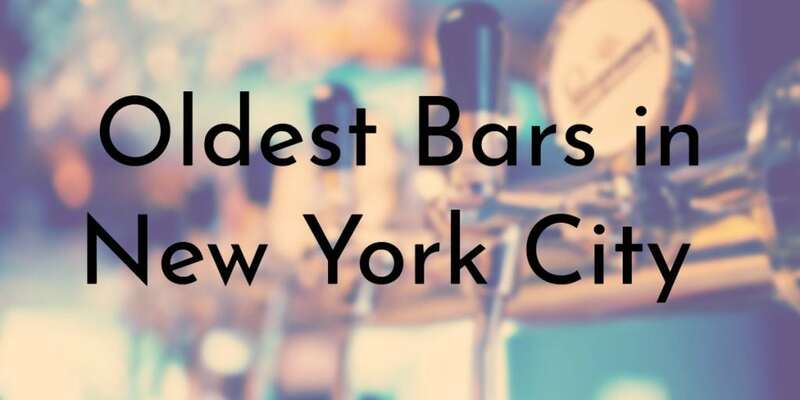 Around the 1950s, the bar began attracting a gay clientele, but the New York State Liquor Authority ordered bars to not serve liquor to the disorderly. At the time, homosexuals were considered “disorderly” and bartenders often kicked out known homosexuals. Despite the harassment from the Julius’ management, gay men continued to visit the bar. On April 21, 1966 four members of the New York Chapter of the Mattachine Society staged a “Sip-In” at the bar to challenge the law that prohibited bars and restaurants from serving homosexuals. The Mattachines then challenged the liquor rule in court and the courts ruled that gays had a right to peacefully assemble. This cleared the way for legally operating gay bars to open in the city. To celebrate the Mattachines, Julius’ now holds a monthly party named after the group. 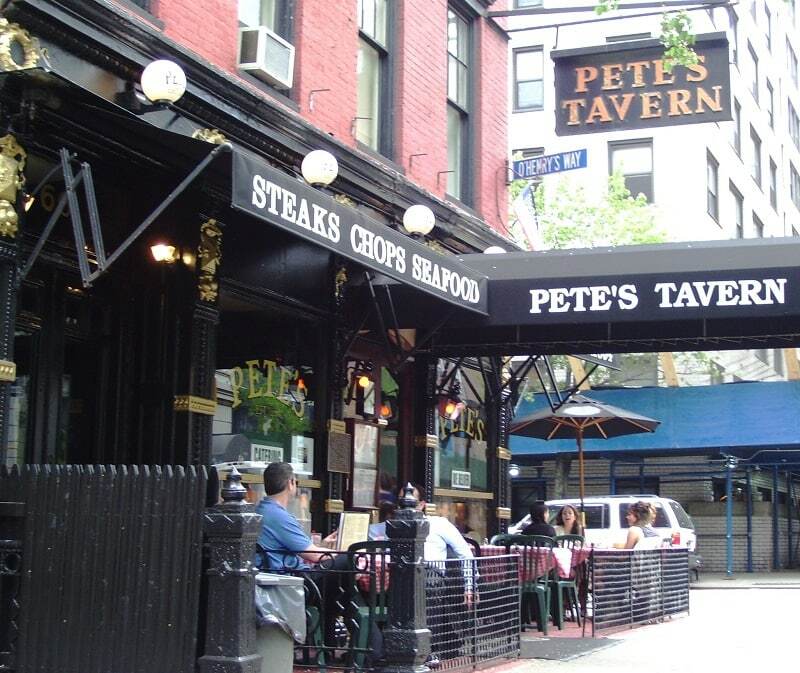 Although Pete’s Tavern is the sixth entry on this list, the bar claims that it is the oldest continuously operating bar and restaurant in New York City. The building housing Pete’s was built in 1829 and was initially called the Portman Hotel. Alcohol may have been served from the premises as early as 1851 or 1852, but it did not officially become a tavern until 1864. In 1899, Tom and John Healy bought the tavern and changed its name to Healy’s. The writer O. Henry lived down the street and frequented the bar. 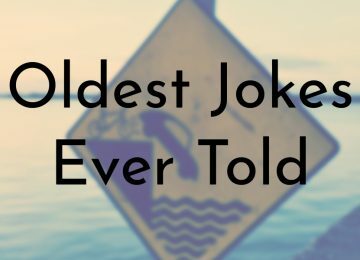 According to legend, O. Henry wrote his famous short story “The Gift of the Magi” at the bar. Pete’s Tavern says that it is definitively the oldest continuously running bar because it legally remained open during Prohibition. The bar is next door to what used to be Tammany Hall, which was the political machine of New York City at the time. Although Prohibition was in effect, politicians still needed a place to drink and socialize, so the bar was disguised as a flower shop. The front room where the bar is located had all of its windows blacked out and the doors were kept locked. People entered through the “flower shop” entrance and went through a fake refrigerator to access the bar. 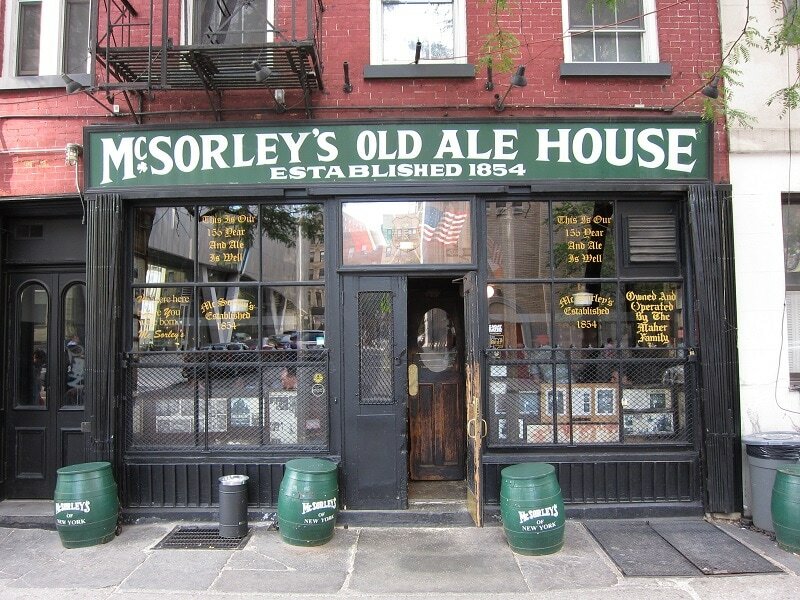 McSorley’s Old Ale House is the oldest “Irish” tavern in New York City. 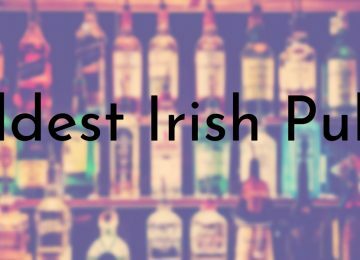 According to the bar’s history, it was opened in 1854 by John McSorley, who emigrated from Ireland to New York in 1851, after the Irish Potato Famine (1845 – 1849). 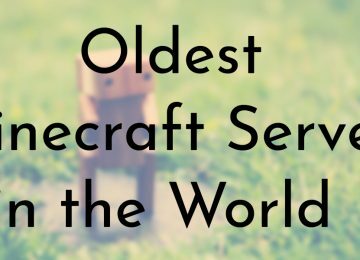 He opened the tavern after a few years and called it The Old House at Home. 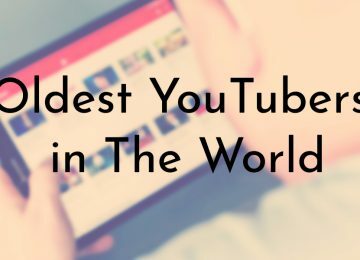 Although this history comes directly from the bar itself, historical research conducted by people not personally connected to the bar and old city records challenge some of these dates. After McSorley died in 1910, his son Bill takes over the bar and runs it until 1936. Bill sells the bar to Daniel O’Connell a longtime patron of the bar and retired policeman. Prior to 1970, McSorley’s was a “men’s only bar.” The bar was finally opened to women after National Organization for Women attorneys Faith Seidenberg and Karen DeCrow filed a discrimination case against the bar in District Court and won. Over the years, McSorley’s has had a number of famous visitors including Abraham Lincoln, Ulysses S. Grant, Teddy Roosevelt, E. E. Cummings, Hunter S. Thompson, and Dustin Hoffman. 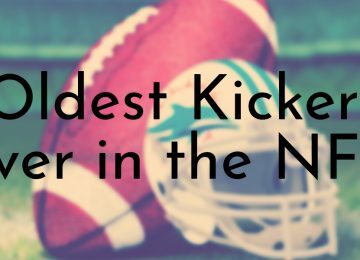 Neir’s Tavern is the oldest bar in the Queens borough of New York City. It was first opened in 1829 by Cadwaller R. Colden as The Blue Pump Room. Colden was the manager of the Union Course Race Track and built the bar near by. In 1835, the bar’s name was changed to The Old Abbey. As the Union Course Race Track declined, so did The Old Abbey. It became known for selling rum to “black legs, thieves, housebreakers [and] fighting men” who frequented the track before its demise. In 1851, Nathan F. Graves, a politician and banker, purchased The Old Abbey and cleaned it up. Graves ran the bar for the next 40 years. It was then sold to Louis Neir in 1898 and he added a ballroom, bowling alley, and rooms upstairs for a hotel and renamed it Neir’s Social Hall. The Neir Family continued to own and operate the bar until they sold it in 1967. The bar declined and was closed in 2009 until it was purchased by new owners, who extensively restored the historic bar. 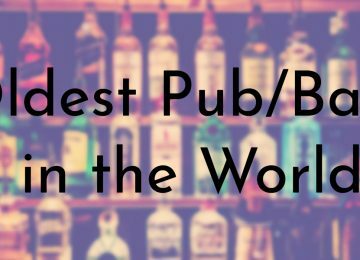 The Ear Inn is one of the oldest drinking establishments still operating in New York City. The tavern is on the ground level of the historic James Brown House, which was first built in 1770 for James Brown, an African American aide to George Washington during the Revolutionary War. After Brown passed away, the house was sold and records show that it was used as a bar around 1835. 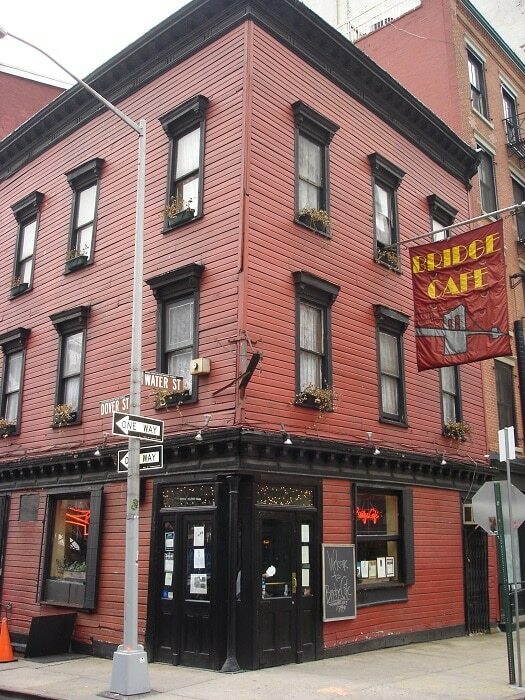 Although the Bridge Cafe has been closed since 2012, the restaurant and bar is still considered one of the oldest in New York City. The building was originally opened in 1794 as a grocery and wine and porter bottler. 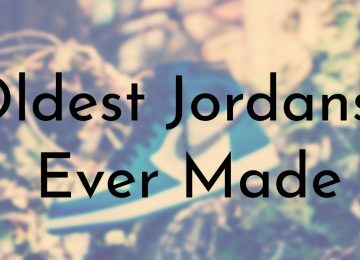 Since then, it has been home to various restaurants and drinking establishments. From 1847 to 1860, a man named Henry Williams used the building to run a brothel. The building’s current exterior was updated in 1888. Since 1979, the Bridge Cafe has been owned by Adam Weprin’s (the current owner) family. Unfortunately, the building was extensively damaged by Hurricane Sandy in 2012 and the bar has been closed since then. The last update on the bar’s renovations came in 2016 when Weprin said he hoped it would be open again by Valentine’s Day of that year. 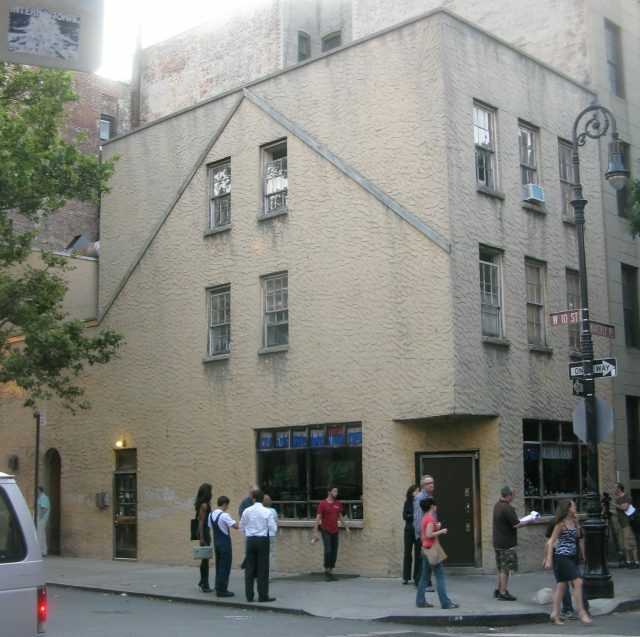 Although the title is often disputed, Fraunces Tavern is widely considered the oldest bar in New York City. 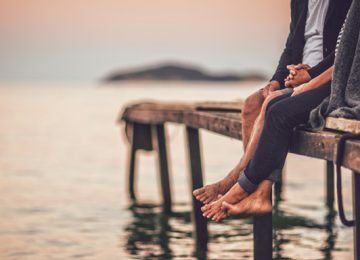 Mayor Stephanus van Cortlandt first built a house on the site in 1671 and passed the property on to his daughter and her husband when he retired. They built the current building as a house in 1719 and they rented out the house for several years. In 1759, the firm De Lancey, Robinson, & Co. purchased the building. The company offered rooms for rent, but eventually had to sell the house in 1762 to Samuel Fraunces, who converted the building into a tavern called the Queen’s Head Tavern. The tavern became a meeting place for several groups before, during, and after the American Revolution. 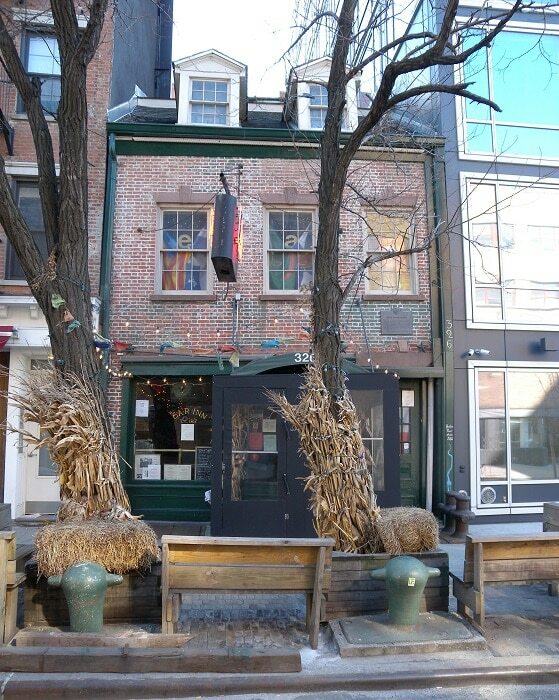 Today, Fraunces Tavern is a historic landmark (on the U.S. National Register of Historic Places) that still operates as a restaurant/bar as well as a museum. 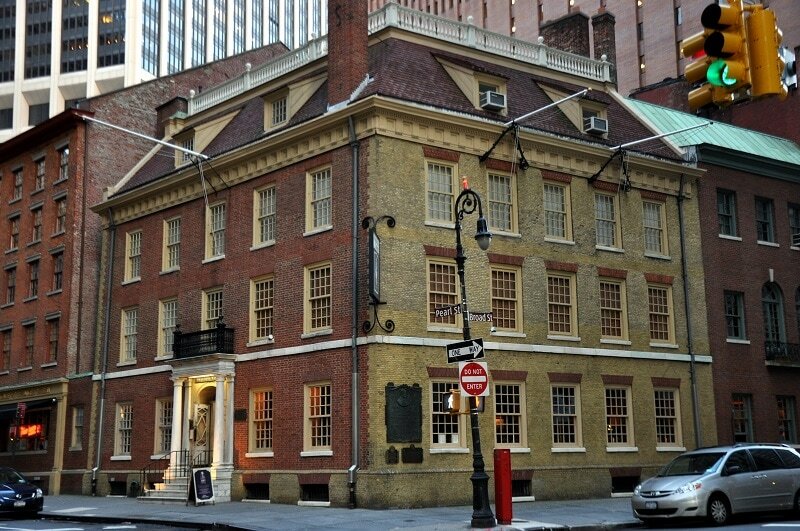 Since 1904, Fraunces Tavern has been owned by the Sons of the Revolution.